Florence SC | Follow the Tumble Lees! This post will be a bit different from just traveling. We are back on the road, so a bit about putting our rig in and then out of “storage,” the crazy journey here on a road we never want to drive the motorhome on again, the crazy weather since arriving…and a marriage issue…. On September 16, as we left our daughter’s home in Virginia, we had an unexpected trip down to Florida for a few weeks to help my mom out. 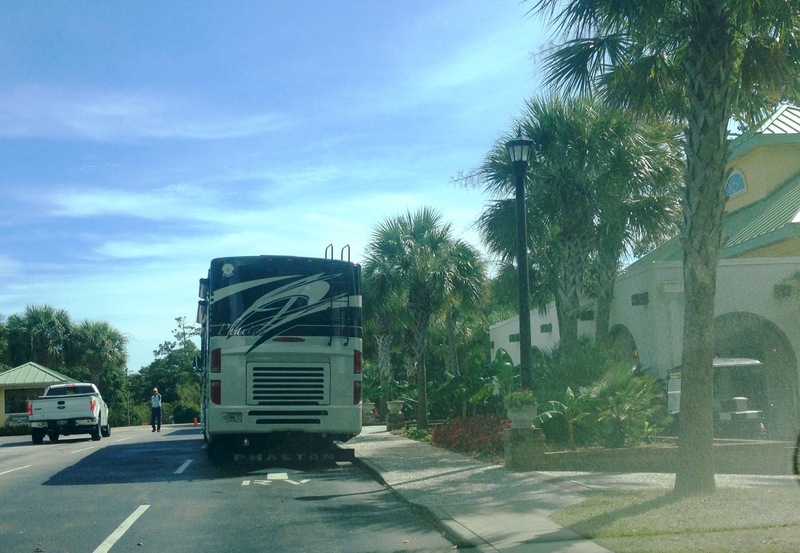 Because we needed to get there by a certain date and had planned a month at Myrtle Beach (for the monthly rate discount), it would not have been fortuitous to drive the motorhome 800 miles. Our solution was to drive it nearly 1/2 way, park it in Florence, SC for the three weeks to a month, and then we’d only be a few hours from Myrtle Beach. Aside from the fact Hurricane Joquin belted Florence and along with much of South Carolina, this was the perfect plan. Thankfully, since we had a relationship with the owners at the campground, they allowed us to use a 30 amp receptacle so we wouldn’t have to disconnect our batteries (Bill was researching this) and then throw out much of our food in the freezer and fridge (we do love our residential fridge) and leave the doors open. We felt at peace leaving our home but sure were unnerved as we watched the weather reports. We did call and they assured us the campground was fine where we were parked. I took this snapshot as we drove out of the campground. Things turned out better than we expected during our time helping my mom. It was a rewarding time for the family. And Bill had time to finally sort through and clean out our 5′ X 10′ storage locker. In the end, we didn’t have anything valuable enough worth paying the rent on. We just were sorry we didn’t have more time when we sold our home. But as they say, it is what it is! We were ready to pick up our motorhome on October 6, a Tuesday. But then there was that hurricane, and I-95 was shut down for miles, before and after Florence. We waited another day. Not only did the roadways begin to open up, but we had great news for my folks. So we quickly packed up and headed to Kingsland, GA to spend the night. The roads and weather were still a bit iffy, although the campground told us we could come on up. As it turned out, we did have to take a 60-mile detour, which also cost us 60 minutes. But in the grand scheme of things, it was OK. We since found the right website which would have better prepared us. 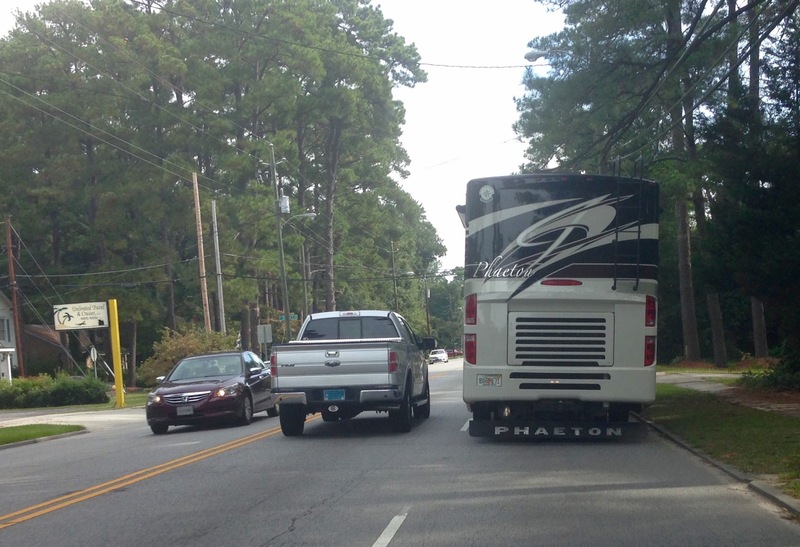 Here are a few pictures showing the route (and traffic) of our detour. Traffic back up for a short time. 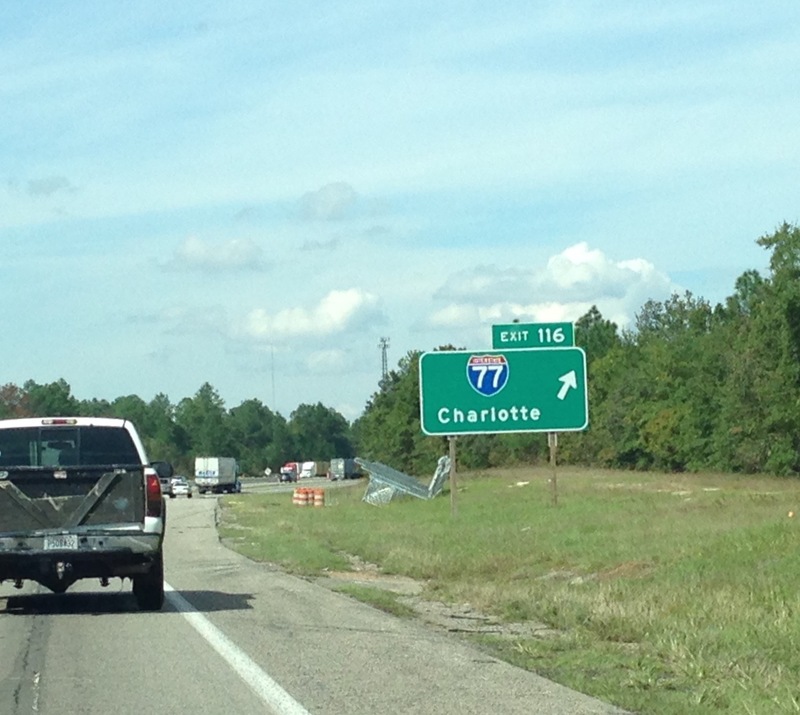 This sign was confusing as we were looking for I-26. This sign made more sense to us. 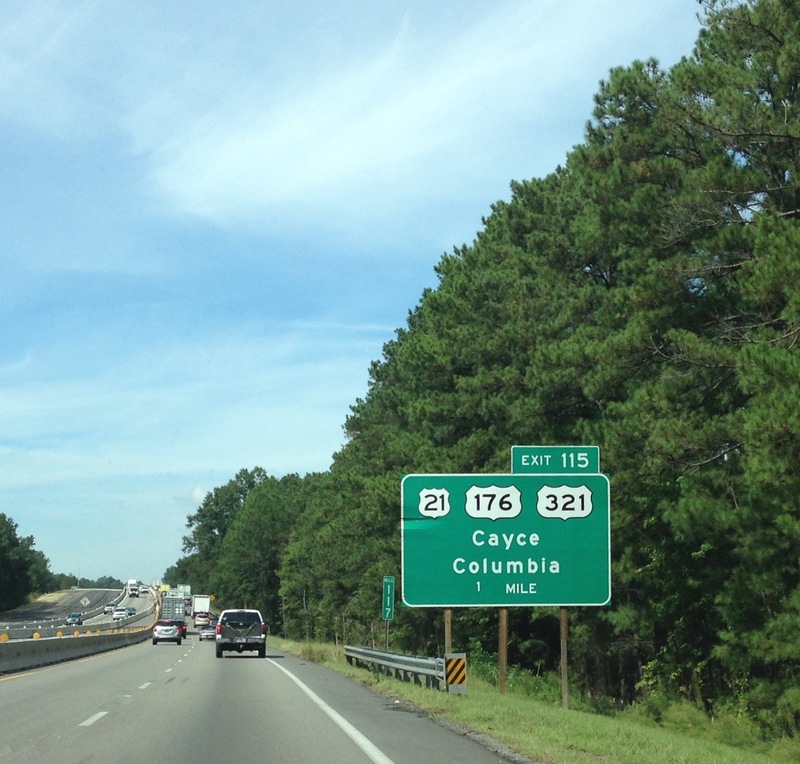 Finally, our destination, Florence, SC. We happily reunited with our motorhome. And thankfully, the electric stayed on the entire time, so no rotten food! Everything worked. Since it has been a grueling trip with the detour, we decided to spend the night. We needed fresh vegetables, so off to the store we went. And we were able to scope out the highway for our departure. Southbound I-95 was still closed and that was our preferred route to the beach. Now what to do? 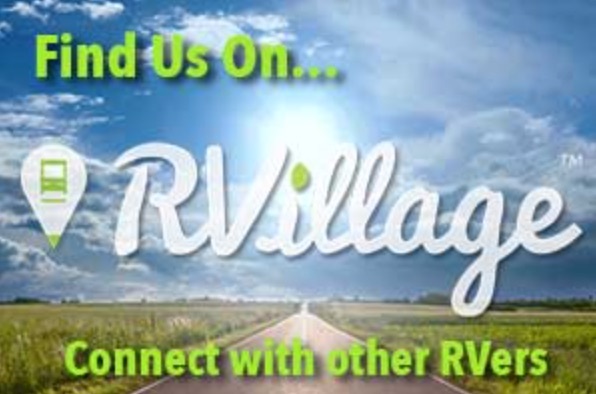 The next morning, try as we might, we depended on our new GPS that lets you set it for an RV. We think it knows Bill doesn’t want to drive in a town with lots of traffic and narrow roads. We were in this type of traffic for nearly an hour. The good news is that although Bill thought he was going to lose his mirrors, he drove beautifully and no white knuckles. Finally, we began to see daylight, we would arrive at the beach this day! The entrance to Pirateland and to check in. Not an easy campground to maneuver in. That’s Bill turning onto the road to back into our site. We are finally here, our long-awaited trip to the beach. 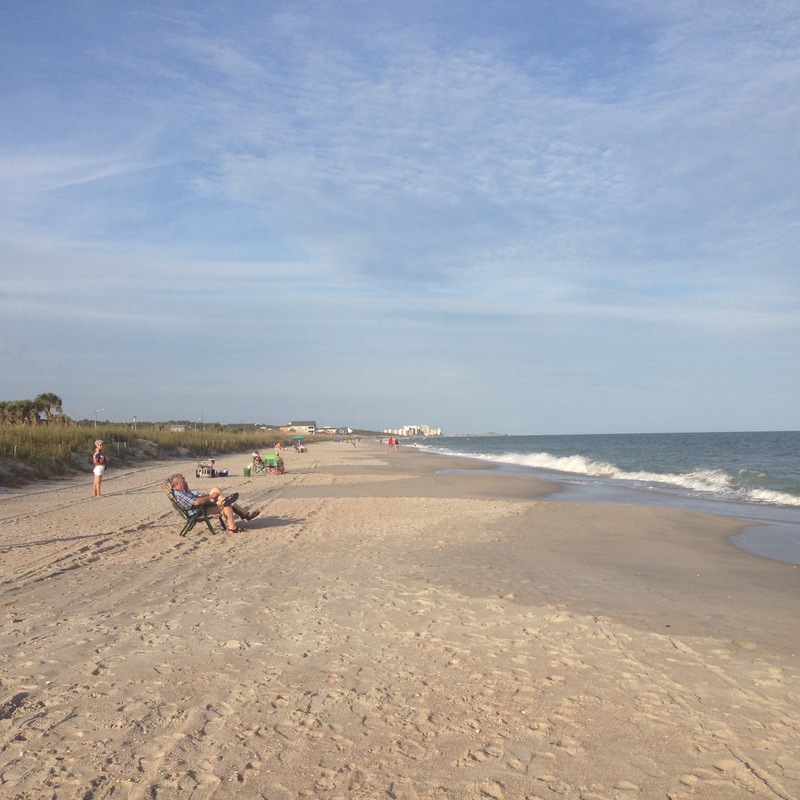 If you remember, we love the beach and that was really what helped solidify our relationship when we first began to date – if you can call what we did date! We really met, fell in love and got married within a few months! Bill won’t pose for a picture, so I just said, “Hey Bill” and snapped this as he turned around! This is why we like Myrtle Beach! It’s the beach! Now, I’ll happily pose….but I usually have too much paraphernalia. We walked three miles our first time out! We sat outside with our neighbors and chatted as the Lord gave us a picture show! Next up, what do we mean, “Changing our minds?” And what does this have to do with our marriage? This isn’t how we prefer to travel…. We already wrote about our “ideal travel day“. Since we recently traveled a few days that weren’t our ideal, we thought we would share about it. Life on the road as a full time RVer is exciting, addicting, full of adventure, just a great way to live and be active everyday. Sounds ideal, doesn’t it? 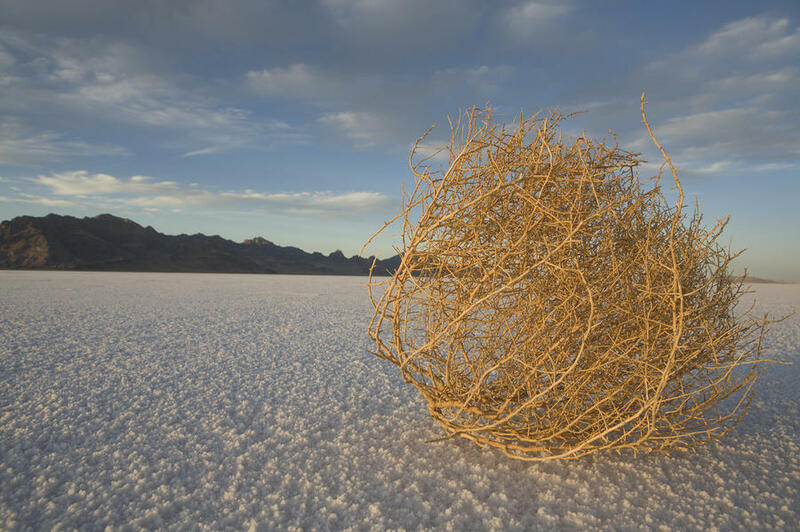 But life still goes on and then we got one of those dreaded phone calls…. 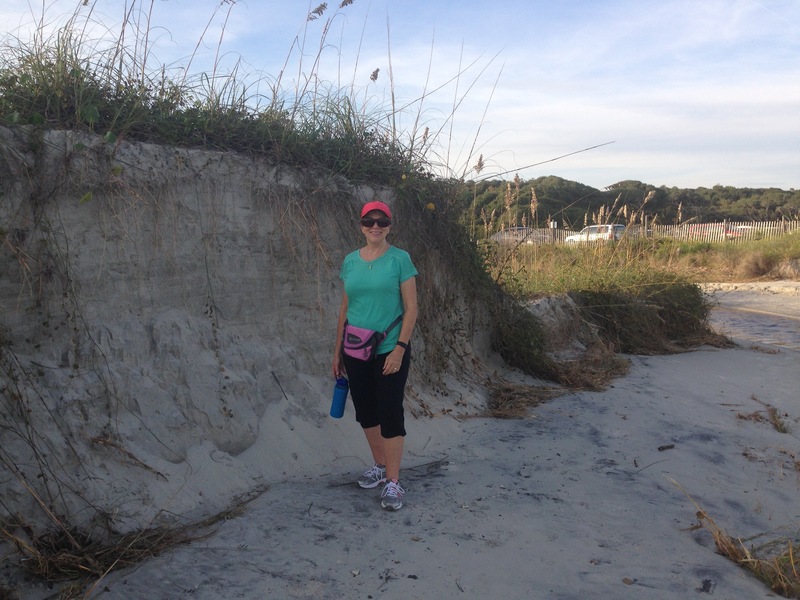 On March 22, 2015, we were in our seventh Florida State Park, Little Talbot Island, Jacksonville. While we’ve visited here a few other times (and Bill lived in Jacksonville before marriage), we never camped on the island. We imagined four action packed and full days, but the weather didn’t cooperate. So we slowed down and just enjoyed the beach with long walks, dressed warmly and dreamed about our next adventure. That plan was to finally visit Wilmington, NC. It has many beaches there and we wonder if it might be THE place we would eventually settle in. And then on that date, Debbie received that dreaded phone call, Cancer. Oh no, another loved one afflicted. We’ve both lost our dads to cancer. What is it with this disease? We hated the phone call, and now we had a bit of a dilemma. When we left our daughter’s home in early January, we promised her we would return on April 1, which was just a week and a few days away. What could we do back home we wondered? We were praying, but what else could we do? As the day to head north came, March 25, we still didn’t know where to stay in Wilmington, and now we see for a reason….We decided to head back down south. As it turned out, we actually were needed….please pray for our family as we begin another dreaded cancer journey. After being with Debbie’s family for that week, it was time to head back to our daughter’s home. She understandably knew we couldn’t keep the April 1 date, but she was anxious for our arrival (she always has repairs/remodeling things for her dad). And we were both compelled to get there as soon as possible because it had been a full three months since we had seen our only grandchild. And he is the reason we started our adventure travels, so we at least have to come see him every few months! As former work-a-holics, we are really trying to take life slow and easy. And that means, our ideal travel day is around 250 miles and we like to keep it to around four to five hours driving time. While we prefer to stay any one place a week, we could only get in most of the Florida State Parks four days since we made last minute reservations. It was also the month of “Spring Breaks” for every school district and college in Florida and within a state or two of Florida! On March 31, we sadly headed back up north, and decided to break our “rules” of travel. We decided to travel as fast as we could and get there by April 2, just a day late. We guess us work-a-holics are also compulsive promise keepers. So that meant, we would stay one night at two different campgrounds for the 870 plus miles and 14 hours of driving time. 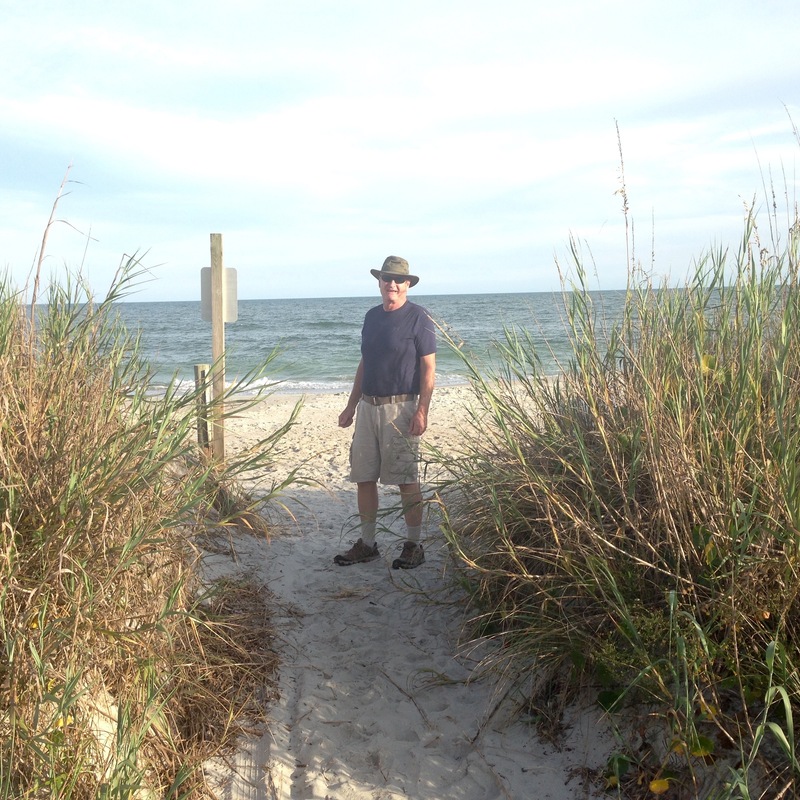 As members of Passport America, we could find inexpensive campgrounds near I-95. Little did we realize March 31, a Tuesday, was probably one of the biggest travel days in Florida as all the snowbirds are heading north. Our first stop was 287 miles and it should have been about a five hour drive. With all the traffic, it was a six hour trip. We decided to try Walkabout Camp & RV Park, just seven miles north of the Georgia/Florida State line. We had actually tried to stay here one other time and I (Debbie) was glad they were fully booked due to a “rally” of some sort. It was unimpressive…at least that day. But now it was really an ideal location and we ended up being very pleased. For me, Debbie, being able to actually walk about and get in a two mile walk is my ideal. Guess now we know where the name came from. It looked small and uninviting the first time we stopped in. It was actually a little bigger and it has some nature trails. So we couldn’t manage 2 miles, we got close. What also really helps any campground is that initial friendly and welcoming check in! And this park is managed by the owner who was happy to oblige! Click here for our review which includes pictures. 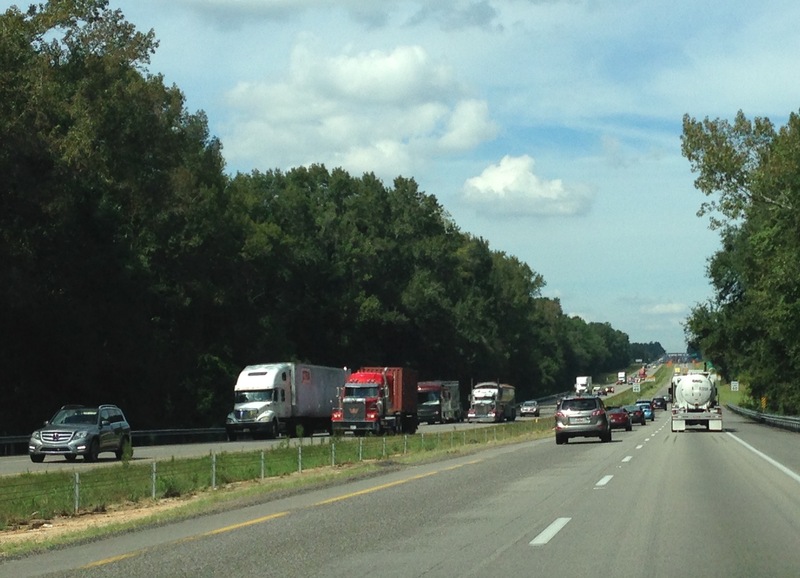 The next leg of our trip included a bit of a traffic nightmare. 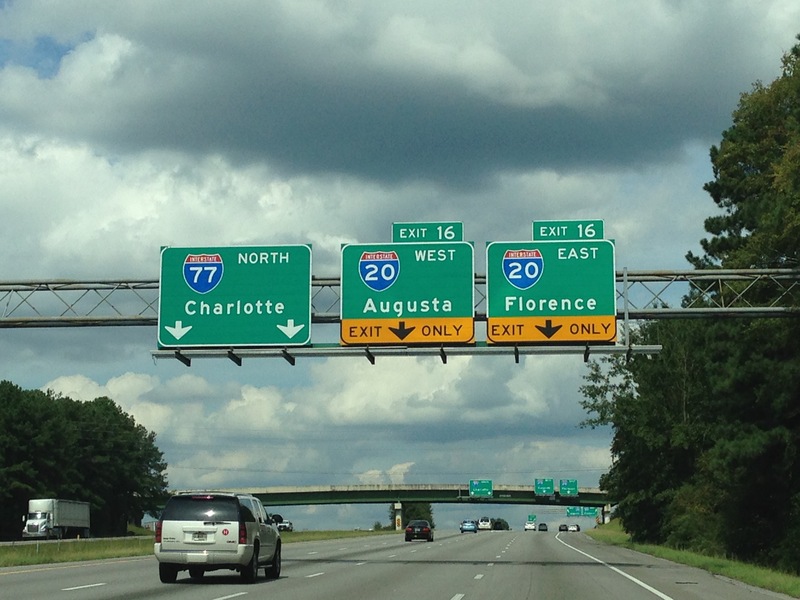 Bill likes to calculate our travel by using the 250 mile rule, which would be around Florence, SC. There was bridge repair work being done on I-95 north bound for about 45 days, which meant the already narrow two lane highway would merge into one lane near the bridge repairs. And this was a minimum of an hour delay, or the detour which was 30 miles and would add at least an hour to the trip. Bill wanted to stop before the detour, but Debbie really wanted to press on. But since Bill was the driver and Debbie likes to maintain a peaceful relationship :-}, she bit her tongue and tried to make the best of it. 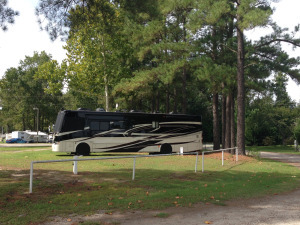 We had stayed here once before, the Swamp Fox Campground, Florence, SC for one night, 1/7-8/2015. This was the day of the great polar vortex, or was it the second or third one. No matter how many, our pipes did freeze, but fortunately, no damage was done. We really didn’t spend any time there as we had traveled 353 miles (and over seven hours) from Fredericksburg. But this time, we only drove a little over 250 miles in about four hours. That’s an ideal drive! We arrived early enough to do laundry and Debbie managed to get in a 1.3 mile walk. 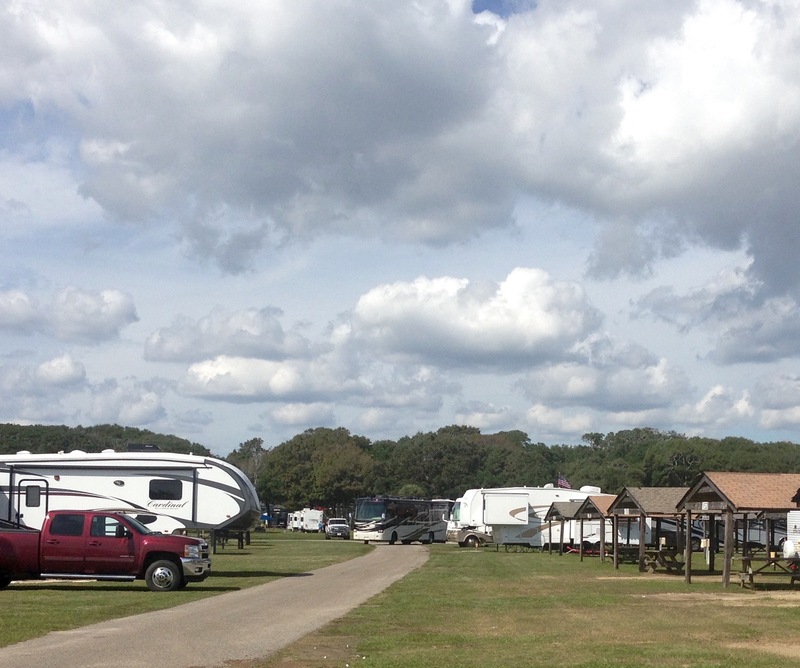 To read about this campground, click here for our review, which also includes pictures. As it turned out, on April 2, 2015, a Thursday, there was no traffic delay since there was no construction! It appears to us, the best travel day is on Thursdays and this date proved it. We had an aggressive drive, 342 miles and over five hours, BUT we made fantastic time! We arrived at 2:00 pm. 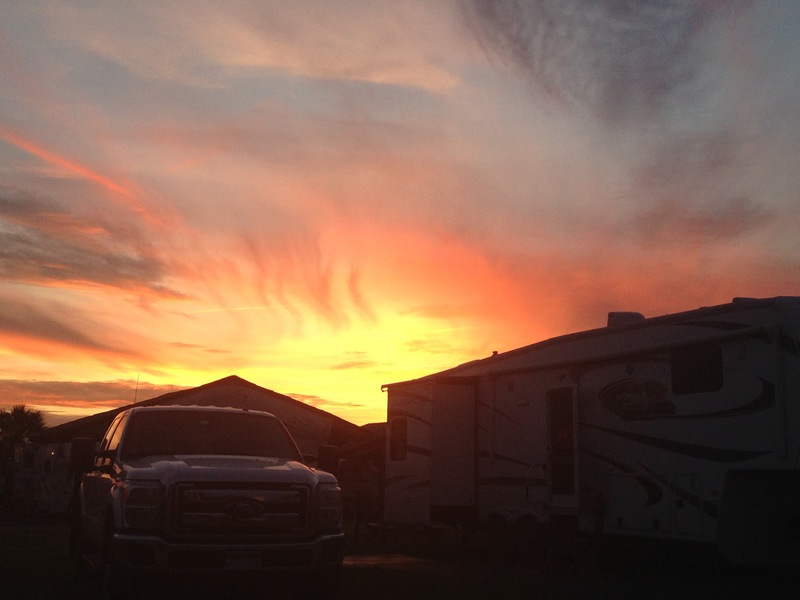 We were nervous about the campground, R & D Family Campground in Milford, VA, but our concerns were unfounded. 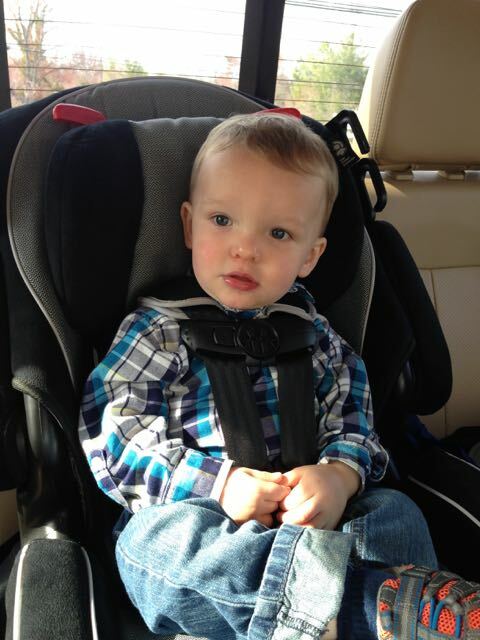 Our campsite was level and we were hooked up and ready to go pick our grandson up from daycare in record time! We had a grand reunion with him and he even spent the night with us….he revived us after a long but smooth day of travel. Click here for our review of this campground. Colin catching us up on the past three months! So even though this was not the ideal way to travel, the reward at the end of the push was well worth it! He gave us both a big smile, tight hug and kissed our cheeks!